Last night I visited my friend Ellen. She lives a matter of blocks from me, yet somehow it was the first time I had managed to take her up on an invitation. I concocted a new cocktail for the occasion. A few years ago Hospitality Club provided my roommates and I the opportunity to host a guest named Guillermo from Columbia. He arrived bearing this incredibly sweet liquor. As I recall, Molly and I made quick work of it. 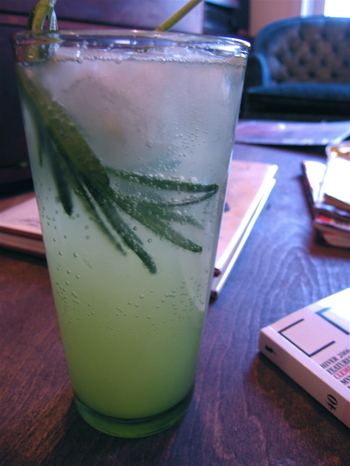 In a tall glass put two rosemary sprigs and fill with ice cubes. Almost fill the glass with equal parts Limoncello and seltzer water. Squeeze half a lemon into the glass. Stir and serve. The rosemary was nice, but next time I am going to try basil. This was my original intention, but the grocery store was out. For the basil variation, I would suggest muddling the leaves a bit before adding the liquid. This will help the flavor permeate. Whichever herb you choose, this is a perfect summer drink. Sadly, it still feels like February in Chicago. For dinner, Ellen made a gorgeous frittata. She lined a cast-iron skillet with slices of potato and piled cherry tomatoes, onions, garlic, feta and asparagus on top. After pouring the egg over these ingredients she baked the frittata. Oddly, I had never considered baking a frittata and instead have always made them on the stove. Her method is clearly superior. 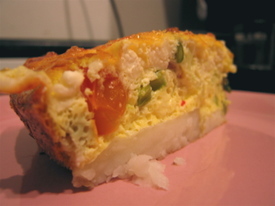 The frittata was perfectly cooked through and came out tall and airy. The potato "crust" was particularly ingenious. In other news, this weekend was more culinary-centric than most. On Friday, Harold and I went to the IACP Cookbook Expo. I met Heidi Swanson of 101 Cookbooks in person and purchased her gorgeous new cookbook. I have been hungrily reading through it and highly recommend it. Congratulations Heidi! That evening, Nick and I went to see John Vanderslice. The show was quite good. We were particularly impressed with the opening act, St. Vincent. The next morning we roused ourselves earlier than most weekends and headed to the Union League Club of Chicago to hear Hervé This speak. The event was thought provoking, yet the question and answer session was a bit lacking when it devolved into some pretty egotistical Chicago chefs debating when their skill was craft vs. art. We took the stairs on the way out and enjoyed perusing the ULCC art collection (the second largest private collection in the U.S.). That evening we stayed in, ordered a pizza, and finished the second season of Twin Peaks which I finally own a copy of. It was Nick's first time through and he seemed fairly upset about the last episode. For the past few months we have been fairly obsessed with the Bloomingdale Trail, and finally went up for a walk (from Milwaukee to Elston). I really hope the city decides to support the proposal to turn these old rail lines into a park. It would be a truly unique addition to the city. 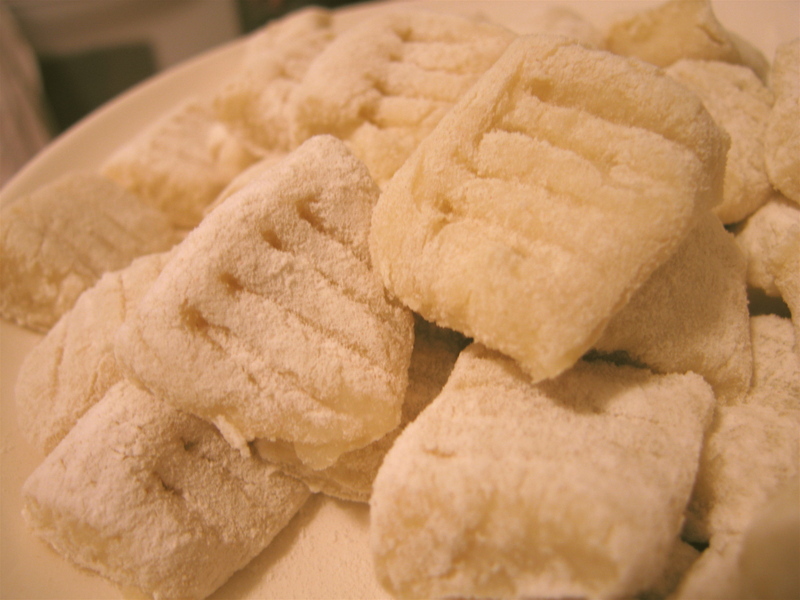 That evening we decided to make gnocchi from scratch. I had tried my hand at it years ago in high school. 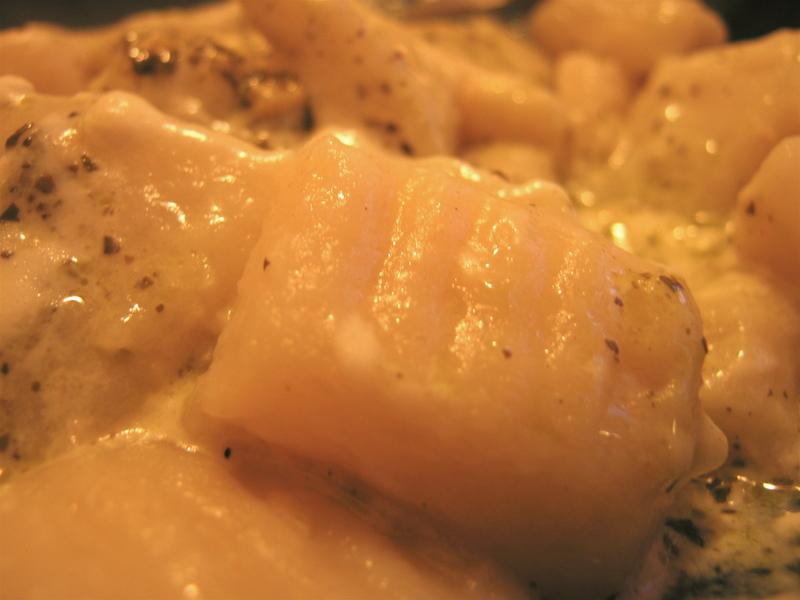 After a fair bit of hard work, the gnocchi completely dissolved into the boiling water. My research informed me that I had been too timid with the flour. It turned out quite well this time and Nick made an excellent garlic and cream sauce. The recipe I used made a huge quantity. We fed three with half of it. I froze the rest and am hoping it will keep well for future use. found it. bought some limoncello. had a reprise with gnocci and spring salad last night. thanks for stopping by! We just finished making our own Limoncello! Thanks for the idea for a new way to enjoy it. Could give a recipe for the gnocchi and sauce? That's one my favorite meals but have never had the courage to try to make it.